BEYOND Max5 Treatment Kit was evaluated by seven consultants in 35 uses. This whitening system received an 87% clinical rating. 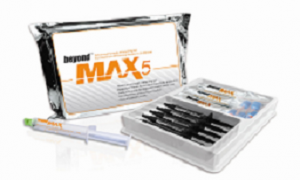 BEYOND Max5 Treatment Kit was rated highest for ease of application and removal from the teeth. The syringe dispensing hastens the procedure, and cleanup is minimal. The ability to use the product with any light makes it useable by all practices without an investment in new equipment. Consultants would like to have the gingival protection gel adhere better to the tissue and be a higher viscosity. Most consultants applied the whitening gel for 15 minutes at a time with up to three rounds per appointment. The volume of whitening gel was not adequate for every patient, depending on the number of teeth being treated. Sixty percent of consultants reported BEYOND Max5 Treatment Kit was equivalent to their current in-office tooth whitening system, whereas 20% reported it was better. Twenty percent of consultants would switch to BEYOND Max5 Treatment Kit and 20% would recommend it to their colleagues. Most of the patients reported that they did not experience discomfort during the whitening process. Of those patients that did experience some discomfort, on a scale of 1 to 5; 1 being severe and 5 being none, all patients rated the discomfort a 3 or a 4. Average whitening was four shades on the Vita guide with ninety-five percent of the patients reporting that their teeth were whiter.